Home » Amazon warrior costume. Classical antiquity. 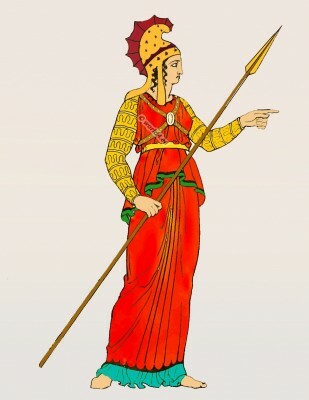 Illustration of a female warrior from the classical Greek mythology. Source, “The costume of the ancient”, by Thomas Hope. The picture was found on a Greek vase. The color reproduction is not to scale. The Amazons. Ancient female warriors. The battles of the Amazons. This entry was posted in Ancient, Ancient Greece, Headdresses and tagged Ancient Greek Costumes, Ancient Greek helmets on 8/26/13 by world4.